Cafe 140 boasts lovely Eggs Benedict if I may say so (after all, this is only the second time I've had it). Tucked in the corner of Stirling & Victoria Street in Bunbury, this modern and chic cafe is easily missed but an old friend A.L. had recommended it to me as the "best place to have lunch in Bunbury". 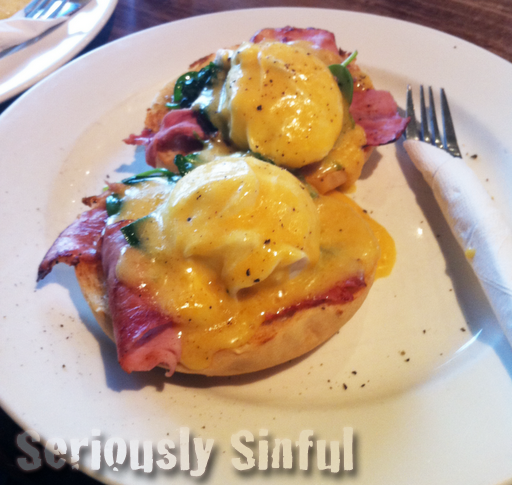 I ordered the Eggs Benedict ($15.95), which like any traditional Eggs Benedict included english muffin halves crowned with bacon, poached eggs and a creamy Hollandaise sauce. However, the Cafe140 version adds spinach leaves to the dish, giving it a refreshing and unexpected texture and depth. Couple this with the perfect balance of buttery-creamy sauce and my favorite poached eggs? Baby, we have a winner! 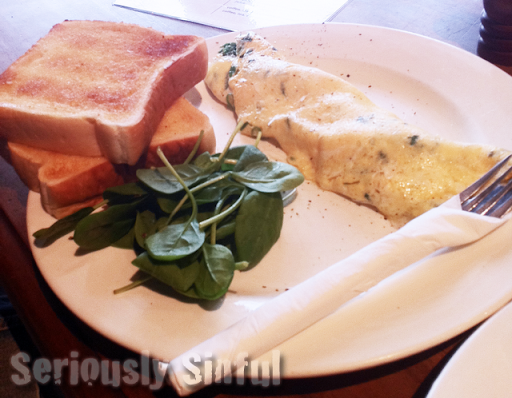 Andrew ordered the Omelette ($14.95), which consisted of two cheeses fried with eggs, two thick slices of toast and onion jam. I admit we treated the onion jam with caution (any chef knows that onions make people tear up!). However, the savory-sweet treat wasn't what we had expected at all and we were quite pleasantly surprised at the way that the different flavors combined in this dish. The only shortcoming was the coffee. I ordered the Flat White ($3.80) - to all you non-aussies, that's pretty much a different version of a Latte. Basically, it tasted like the good old Flat White coffee I get at university... i.e. not worth the money. A little unfortunate, as the food was really delicious! After 3 hours of driving on an empty stomach, the filling portions hit the right spot, believe me. If I were ever to go down Bunbury way again, Cafe 140 would definitely be on my worthwhile-detour list. Food Blogger based in Singapore & Perth. I love to bake but am abysmal at cooking. Or at least, that's my excuse for visiting places in search of goodeats!